Scottish records are recognised for performances in the senior, under-20, under-17, under-15 and under-13 age groups, with separate records maintained for indoor and outdoor performances. At senior level, records are recognised as National Records (set anywhere in the world by an athlete eligible to represent Scotland), Native Records (set in Scotland by an athlete eligible to represent Scotland) and All-Comers' Records (set in Scotland by any athlete). The record lists in this section show the records which have been officially accepted by Scottish Athletics. SATS also list authentic best performances recognised in events at which official records are not maintained. 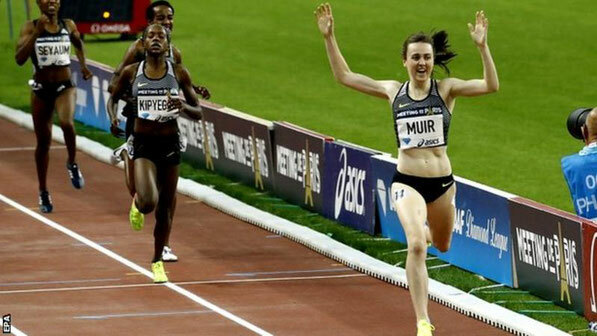 Laura Muir winning the Paris Diamond League meeting with a new 1500 metres record of 3:55.22. SCOTTISH NATIONAL RECORD: for a performance made in or outwith Scotland by a competitor who was born in Scotland, or either of whose parents was born in Scotland, or who has been recognised by Scottish Athletics as eligible through three years continuous residence to be a Scottish athlete for international competition, provided that athlete has not rendered him/herself ineligible to compete for Scotland. SCOTTISH NATIVE RECORD: for a performance made in Scotland by a competitor who was born in Scotland, or either of whose parents was born in Scotland, or who has been recognised by the Scottish Athletics as eligible through three years continuous residence to be a Scottish athlete for international competition, provided that athlete has not rendered him/herself ineligible to compete for Scotland. For athletes to be eligible for Scottish records, they must be registered with Scottish Athletics. Record application forms are available, on request, from Scottish Athletics or may be downloaded from the Scottish Athletics website or the SATS website (see foot of page). · Obtain a Scottish Record application form. · Complete the paper work and obtain the relevant signatures and supporting documents. · Forward the application to Scottish Athletics within 3 calendar months of the performance. Performances are considered for approval by the Records Committee of the Track and Field Commission of Scottish Athletics. That Committee makes its nominations to the Commission for approved records to be recognised. The Commission makes the final decision at its quarterly Track and Field Commission meetings. Record lists are maintained and updated on the website of the Scottish Association of Track Statisticians (SATS), www.scotstats.net. 5. Scottish Athletics will supply the official Record Certificate, for presentation to holders of National, Native and Age-Group Records. a) For senior and under-20 performances, the rules followed by British Athletics will be adhered to. Therefore, no performances set in mixed track races will be acceptable for records. (b) For under-17, under-15 and under-13 performances, performances set in mixed races will be acceptable for records. However, in open graded competition, the rules for the under-13 and under-15 age-groups must be followed. This means that no under-13 performances will be accepted as a record if there are under-17, under-20 or senior athletes in the field; and no under-15 performance will be accepted as a record if there are under-20 or senior athletes in the field. (d) have been declared eligible, selected for and competed for Scotland in an international whilst previously qualified under (a), (b) and (c) and have not since rendered him/herself ineligible by competing for another country, either in the UK or elsewhere.